Micro and Nano PLCs are the programmable logic controllers which provides easy and economical solutions to basic control needs for simple machines ranging from relay replacement to simple control timing and logic and helps in automating the overall process. Globally growing trends of automations is expected to remain one of the key growth drivers for micro and nano PLCs during the period of study. This report identifies the Micro and Nano PLC market size in for the year 2015-2017, and forecast of the same for year 2022. 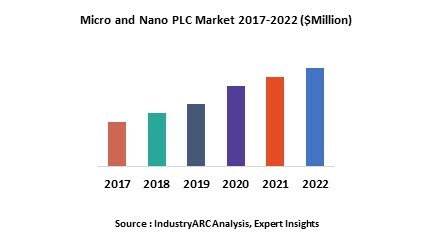 It also highlights the potential growth opportunities in the coming years, while also reviewing the market drivers, restraints, growth indicators, challenges, market dynamics, competitive landscape, and other key aspects with respect to Micro and Nano PLC market. Geographically North America dominated the Micro and Nano PLC market owing to technological advancement and higher rate of automation in various applications as against any other regions. North America was followed by Asia-Pacific and Europe as the second and third largest markets for micro and nano PLC. However Asia-Pacific is expected to remain the fastest growing market during the period of study driven by rapidly expanding industrial base, up gradation of infrastructure and growing adoption of smart manufacturing process across the industries.